Clegg has attacked Liz Truss’ plans for childcare reform and offered a commitment to block the high profile plans. He said he was “absolutely passionate” about improving the quality and availability of childcare but “we have got to get this right”. 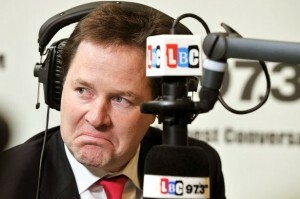 Mr Clegg also questioned whether any change in policy would result in cheaper childcare costs for parents. “I have got young children … they have been through nursery so I know how much parents will really care that we get this right in terms of improving both the affordability of childcare, which we must do, but also the quality. “What the Department for Education did is they consulted and they said is it possible to have an adult look after more children, so instead of four two-year-olds … go up to six two-year-olds. I think four is already quite a handful, just imagine if they go up to six. The Deputy Prime Minister also denied that his intervention will have any impact on plans to offer child care vouchers worth £1,200 to working parents. Neil Leitch, Chief Executive of the Pre-school Learning Alliance, said: ‘Thousands of parents and practitioners, as well as some of the country’s leading early years academics, are against these changes, which will lower the overall quality of childcare in this country. Stephen Twigg, shadow education secretary, said the childcare plans had “descended into chaos”. Linda Davies has rightly outlined what is required to reduce the cost to the provider and as well to the parent. 1) Make Early Years equipment purchases VAT free for providers, the VAT gained can go a long way towards improving the quality standard both for the children and the staff. 2) Free 15 hours should be for the whole year not only for school term time. The providers are losing money during bank holidays and school holidays when the funded children are not paid for and we cannot give their places away and yet we still have to meet the staffing cost for that period. Also the arrangement of ‘term time’ is not suitable for parents who are in employment. Any help from the government should not be half-baked bread. 3) Child tax credit should be paid directly to the provider this will make things easy for the providers to collect their fees on time and use it wisely. It will also help parents not to be in arrears. 4) Government should set up a financial product in which providers should be able to get grants or borrow at a very low interest rate to reduce the cost faced by providers and thereby reduce the childcare cost to parents. 5) Finally, Government needs to look at ways to help providers in reducing the cost of operations such as huge reduction in Business Rates, lower VAT for utilities, help with training costs for staff and increment in the tax allowances for childcare staff. I sincerely believe if all these points are considered by the Government and they make necessary policy changes, the cost of childcare will be drastically reduced and this will help all and sundry. Increased Child:Adult ratios will not be a solution to high childcare cost. Linda, totally agree about the 20% VAT break but also should stop us having to pay tax on NEG. A state maintained nursery or school does not pay tax on money left over in their budgets so why should we. If we are prudent and have a small carry forward then we should be able to replace resources or employ an extra member of staff instead of paying tax on it. I work in a private nursery and am in baby room. 1:3 ratios include : caring for each child’s individual needs, safeguarding every child, paperwork for EYFS, keep home routines for each individual, plan activities around children’s needs, etc etc… If you have 3 children 6-8 weeks old in your care demoted to you it is just about do able, 1:4 or 1:6 is repulsive! The child’s care will go downhill regarding most things. Childcare practitioners only get national minimum wage for the work they do and the patients, care love etc they give its nothing! The problem is government pay childcare money to the families and should be paid straight to the setting the child’s at! Much of what has already been written above I wholeheartedly agree with: 20% VAT break is one of the best ways to reduce costs in childcare and create more equality with Maintained Nurseries who get this tax break; paying the Free Entitlement Funding direct to the provider might also be a significant step too, without the restriction of applying the funding term time only. There is an immense administrative burden on the small, private provider – it is this extreme level of accountability that is so time consuming, that if reduced would enable smaller settings in particular, to make better use of human resources. I can understand that on the face of it, the Government might consider that as child care is such a high human resource cost industry, to increase ratios of the children to staff might go some way to reducing costs. But they are wrong in this assumption, it will not reduce costs; apart from anything else, most of us would not be able to increase the number of children anyway due to space restrictions – and rightly so. As the owner of a private setting, like many with the same values, I hold the staff team in high regard and prioritise staff salary well above the national minimum wage; I also value highly the safety needs of the children and seek to ensure that staff are able to meet each child’s needs individually by providing better ratios than required. I will disregard any attempt by the Government to adversely change the ratios, rather I would prefer to see them acknowledge the need to improve the child:staff ratios to enable early years staff to carry out their day to day work with the children in their care professionally; acknowledge that this will cost more and put the investment into child care that it genuinely needs. Not all private providers should be tarnished with the same brush as the unscrupulous ones; there is always the unscrupulous in all walks of life, but in child care they should be ‘weeded out’ by Ofsted. Seems to me that Ofsted should answer for any operational ‘unscrupulous’ settings in existence. How many of you out there who are not unscrupulous, would not be able to recognise one if you turned up on the doorstep unannounced? Not many! They are increasing 2 year old places in the most deprived areas which bring many difficulties and challenges to all concerned especially nursery settings in managing children’s needs fully. Add to this a special need, disability, child protection, looked after child, behaviour etc and this then becomes even more challenging. Then add on the increase in ratio and it is even worse. Many young newly trained practitioners do not have the knowledge, experience and skills to manage the 1:4 ratio now so increasing to 1:6 is very dangerous and unsafe. Safeguarding would be impacted and health and safety. No provider is going to pass on any financial saving to staff or parents. Most staff earn only the minimum wage in this industry. Rogue providers will love this suggestion as they will consider it excellent to employ less staff for more children thus saving THEM money, it is naïve to consider this saving will be passed on. Please ask Ms Truss to work in a 2 year old room with 30 2 year olds for a week and then to discuss her findings; this will give her a better understanding of what is required. I would happy to enlighten her at my setting. I have an appointment to speak with my MP next week on this subject, I hope I can enlighten them with my report. I would like to see ms Truss visit several settings in deprived areas and demonstrate to us how she would care for children with additional needs,lots of which are complex,while safeguarding all children, supervising free flow doing all the paperwork for each and every child to ensure she is carrying out all requirements for the EYFS with less staff. It can’t be done. It will not raise quality, it will not reduce childcare costs. One thing the government could do to put money into childcare is to pay childcare tax credit direct to the provider. We think they would save lots of money every year! I to hope he follows through with this statement. increasing child:adult ratios will be the worst move ever to this profession. parents don’t like it, most find it hard enough to leave their children now so how on earth are they going to feel if its increased. also to have more children to staff means more food/milk being bought and paper work where staff will want a pay rise there fore nurseries will put fees up and it will not be cost effective for parents. their will be no Quality in childcare if these ratios increase! I think he gets and understands what the masses have been trying to say since this ridiculous suggestion: in order to decrease childcare cost would be to increase ratios of children to adults. As Heather so rightly states “where does the health and safety of the children and the childcare standards come into this debate. The question for me is What is he or what can he do anything about it? Being higly qualified does not mean you grow more arms, legs and produce another pair of eyes at the back of your head, or an increase in wages. In order to provide the individual child with opportunities that will support their development, and encourage learning will not be the main focus until the government recognise the importance of the Early Years sector, the users and the practitioners that are dedicated to their roles. There are so many things wrong with the reforms they want to make, however it has been a few moths and they are still discussing it – is this a way to make them not actually have to discuss the real issues around Private and Voluntary sectors jobs as the majority have had decreases in wages and working hours. So the children that are being cared for have no consistency in the persons caring for them throughout their Early Years through no fault of their own, but have to suffer due to the economy. well said Heather. I absolutely agree. In addition, a more realistic FEYE funding rate based on all year attendance rather than school terms is very much needed. The majority of parents do not work term time only. It makes the management of FEYE a nightmare. 91 per cent of nursery care is delivered by the private and not-for-profit sectors in England (Daycare Trust) and the majority of providers give all year care but funding is limited to school terms. The proposed childcare vouchers for £1200 sounds very attractive but only if in addition to FEYE. Staff used to look after children on a 1:4 under two and 1:5 2 year olds. There was never any issues regarding safety. Reducing the staff ratios is the only way to make it more affordable. The only other way is to make nurserys pay towards it – as the government has with the “free 15 hours”. Those opposing this will be sorry when they are paying for it. I applaud Mr Clegg for saying this – I certainly hope that these are not shallow words and that he follows this through. Increasing Child:adult ratios would further drive down childcare standards, in a system which is being constantly deregulated. Children are precious. Childcare ratios should not be cut. There is no way that this would decrease childcare costs to the parent, in a business culture which is already underfunded. A simple way to reduce costs to the parent?……. Give Childcare providers the 20% VAT break we have been asking for for years. This would make a true difference.